Uttarakhand is one of the most beautiful states in India and hence, you can find innumerable hidden as well as popular places which can certainly send you to the world of retirement. If you are planning for summer vacation and looking for a place where you can spend your time in an uncrowded environment and fresh atmosphere, then you must consider planning a trip to Naukuchiatal in Uttarakhand which is all set to surprise you with its enthralling beauty and surreal location. It is an idyllic destination to spend quality time with family and friends amidst cool breeze, misty clouds and serene aura. So, how about visiting this hidden hill station in Uttarkhand? Read on to know in detail about Naukuchiatal and how to reach it. As the region in and around Naukuchiatal remains cool and pleasant through the year, this tiny wonder is a year-round destination. However, if you are looking forward to witnessing the best of Naukuchiatal, then the best time to visit is from October until the end of April. Naukuchiatal is located in the Nainital district of Uttarakhand and is a small town at an elevation of about 1220 m. The town has derived its name from its popular lake which has nine corners, thereby, giving it the name of Naukuchiatal. Due to its rich and dense vegetation and other natural beauties, it is a weekend spot for the locals and picnic lovers. From deep valleys to sky-high hills, each and every corner of Naukuchiatal is a treat to savour. It also offers its tourists the opportunities of several adventurous activities, such as parasailing, rowing and paddling. On account of its richness in avifauna, Naukuchiatal attracts several bird watchers too. Wouldn't you love to be at such an amazing place which is left to be explored? How about leaving behind all other popular places this season and marking Naukuchiatal as your first destination? Apart from loitering around its natural beauties and exploring its lakes and forests, you can also visit its nearby places, which include hill stations to historical places and temple sites to lakes. These prominent places include Hanuman Temple with a 52-feet-high idol of Lord Hanuman, Sat Tal, Nainital, Almore, Haldwani, Bhimtal and several others. 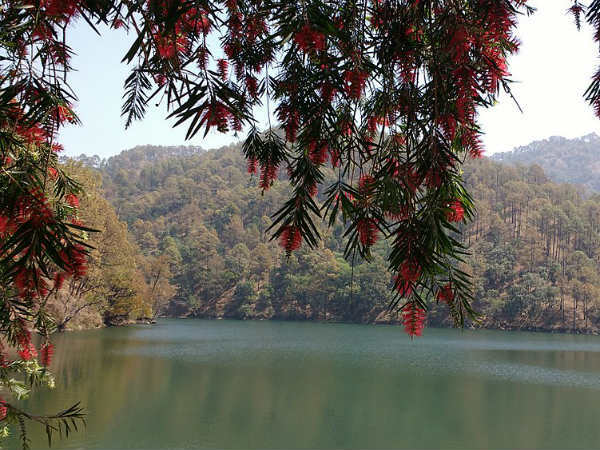 As the surroundings of Naukuchiatal are rich in dense vegetation and diverse wildlife, you can also go capturing its captivating beauty on your camera. It also provides its visitors with the opportunities for trekking, camping and hiking in its hilly terrains and lush grasslands. By Air: The nearest airport from Naukuchiatal is located in Pantnagar at a distance of about 55 km. From the airport, you can hire a taxi to Naukuchiatal, which will take an approximate time of 1 hr. By Rail: There are no direct trains available to Naukuchiatal; however, you can catch a train to Kathgodam railway station and then from there, a taxi to Naukuchiatal. By Road: Naukuchiatal is located at a distance of about 300 km from the state capital, Dehradun, and is easily accessible by road.